CIT - Cork Institute of Technology - Why Choose this Programme? Career advancement – Graduates with complementary skillsets (e.g. Business and Computing) find employment opportunities more easily. Having a technical skill that is understood in the context of business knowledge ensures that your understanding can take you further. Internationalisation – The world marketplace is increasingly global –understanding and an appreciation for that is very useful. Ireland has an economy that is dependent on trade with the rest of the world. Knowing how to interpret, utilise and take advantage of our position is crucial for most businesses. Industry Engagement – This programme exposes students to industry in a very integrated way that corresponds with the student’s development over the year. Throughout the programme students will be exposed to a wide variety of industry practitioners. 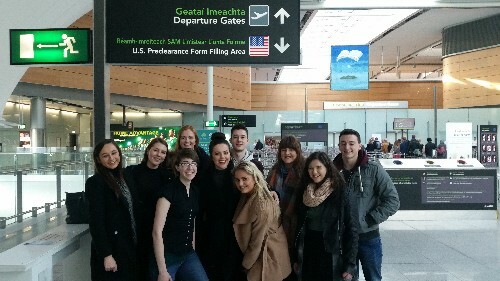 The international Business Field Trip is an opportunity for immersion in non-Irish culture which serves to enhance and deepen the learning experience for students involved. The five day field trip will entail preparation work, learner activity while on the trip and subsequent submissions following the trip. The trip focuses on the skills required to develop business opportunities in new markets. Factory visits on recent trips include Coca-Cola, Audi and the Port of Antwerp. 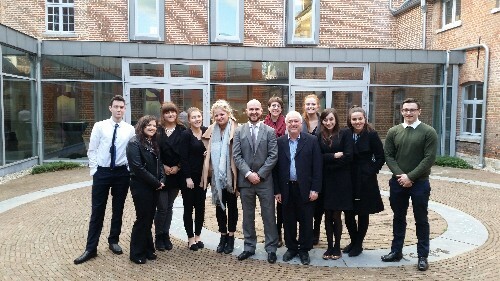 Students from the Bachelor of Business in International Business with Language on a recent Business Trip to Belgium. Such a trip is also a feature of the MSc in International Business. The Seminar Series module allows students the opportunity to draw upon their learning throughout the programme and to synthesise that in the context of some direct exposure to industry leaders. Speakers, drawn from the private, public and voluntary sectors will be invited to speak on a weekly basis and to explore concepts relating to leadership, growth, change, people management, the macro environment and personal & professional development. Students will attend these sessions and develop their knowledge of the topics being discussed and coupled that with insight into their own understanding of the business environment. The Applied Business Project is a capstone module which brings together the learning from the programme which is applied to a business-set project. Students will undertake a significant piece of work tacking a project for a linked company on a consultancy basis. The may be for a company the student is working for. The project will help to develop analysis and research skills but also further a student’s understanding of the international environment.